1. From Srednji vrh to Trupejevo poldne and back. We shall begin our trip at Srednji Vrh above the village Gozd Martuljek. 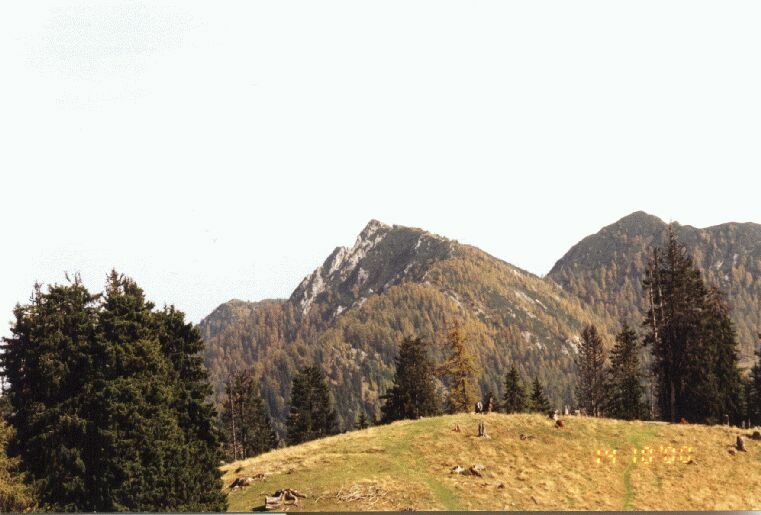 From here the way leads us on the lonely path above the brook Hladnik up to the hunter log behind the mountain Lepi Vrh. The walking is not too hard and the ascend is moderate. All the time we are listening to the murmuring of the brook deeply below on our right hand. For the first time we take a rest at the hunter log because we have to prepare us for the harder section. The first rest is over and we are walking again. The path is going up in serpentines with short straight sections up to the pastures under Krešišèe. Here we can see the numerous holes - homes of the marmots and if we shall be lucky we shall see them. 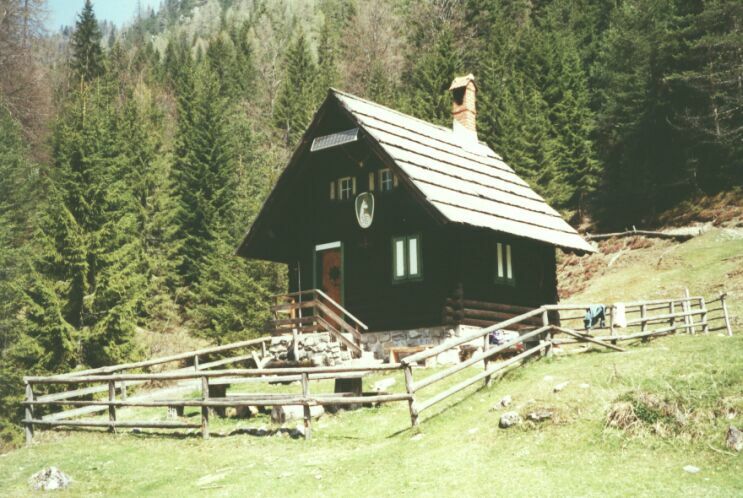 We continue our hiking, the way is still up, to Trupejevo poldne. On all this section we shall have the beautiful views. We shall enjoy in the virgin beauty of nature. We have came to the pass below Trupejevo poldne (1.800 m).Who is strong enough, will conquer the peak and he will not be disappointed. The view from 1.931 m high peak is really fantastic. Now our way is going down and we shall descend to valley named Železnica. Once upon a time people were seeking here for iron and probably excavated it in small quantities. In this valley is situated another hunter log and it should be smart to take a little rest. We continue our way down and very quickly we saw another creek named Jerman who accompanies us till the little rural village Srednji vrh. 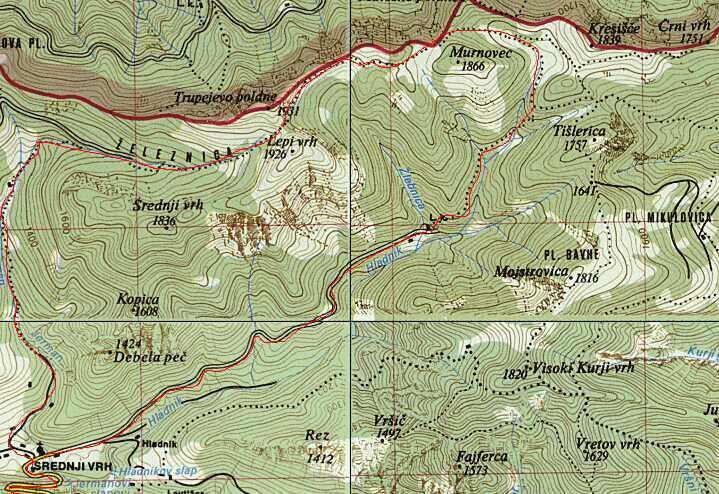 The trip is suitable for hikers with the good condition and it last about 7 hours incl. rests. The relative altitude is abt. 1.000 m. The arriving to the initial place should be with car. Parking is not problematic.